Jacques Offenbach (born Jacob Offenbach; 20 June 1819 – 5 October 1880) was a German-born French composer and cellist of the Romantic era and one of the originators of the operetta form. Of German-Jewish ancestry, he was one of the most influential composers of popular music in Europe in the 19th century, and many of his works remain in the repertory. Offenbach's numerous operettas, such as Orpheus in the Underworld, and La belle Hélène, were extremely popular in both France and the English-speaking world during the 1850s and 1860s. They combined political and cultural satire with witty grand opera parodies. His popularity in France went down during the 1870s after the Second Empire, and he fled France, but during the last years of his life, his popularity rebounded, and several of his operettas are still performed. While his name remains associated most closely with the French operetta and the Second Empire, it is Offenbach's one fully operatic masterpiece, The Tales of Hoffmann (Les Contes d'Hoffmann), composed at the end of his career, that has become the most familiar of Offenbach's works in major opera houses. Offenbach's father, born Isaac Eberst (though this is unconfirmed) in Offenbach am Main around 1780, took the name Offenbach due to the Napoleonic edict of 1807 when he was already in Deutz where he moved in 1802. He was a man of many talents who worked as a bookbinder, translator, publisher, music teacher and composer and became a cantor some 30 years later, and himself wrote several works, including a well known Haggadah (Passover home service). In 1816 the family moved to Cologne, where his son Jacob (changed to Jacques when he arrived to study in Paris) was born in 1819. In 1833 his father took Jacob to Paris and managed to get him admitted as a cello student to the Paris Conservatoire. Financial difficulties forced Jacques, as he was known by then, to break off his studies at the end of 1834. After a few odd jobs he eventually found a position as a cellist in the orchestra of the Opéra-Comique. He soon made a name for himself as a cello virtuoso, appearing with famous pianists like the young Anton Rubinstein, Franz Liszt, Felix Mendelssohn, and, very often, with Friedrich von Flotow, with whom he performed jointly composed pieces. In 1844, he married Hérminie D'Alcain, the daughter of the Spanish Ambassador, and allegedly converted to Catholicism, though no parish records exist to confirm this. He moved to Germany with his wife and daughter in 1848 to escape revolutionary violence in France, but returned after a brief stay. In 1850, he became conductor of the Théâtre Français, but the musical theatre establishment in Paris did not immediately accept his sometimes pointed songs and music. Therefore, in 1855, he rented for the Expo season a little theatre on the Champs-Élysées and named it the Bouffes Parisiens . In the following winter he moved the Bouffes to a larger and, above all, heatable theatre on rue Monsigny/Passage Choiseul (still in the family's hands). There he began a successful career devoted largely to composing operettas. In the early years, Offenbach's permit limited his productions to one-act works with only a few speaking or singing characters. Les deux aveugles, Ba-ta-clan (both premiering in 1855), and La bonne d'enfant were three of his popular works from this period. Only in 1858, after these restrictions had been lifted, did it become possible for him to produce his first full-length work, Orpheus in the Underworld. Offenbach wrote almost 100 operettas, some of which were wildly popular in his time, and his most popular works are still performed regularly today. The best of these works combined hilarious political and cultural satire with witty grand opera parodies. His best-known operettas in the English-speaking world are Orpheus in the Underworld (1858), La belle Hélène (1864), La vie parisienne (1866), The Grand Duchess of Gerolstein (1867), and La Périchole (1868). Les brigands (1869) was very popular in the English-speaking world initially but was later forgotten. Offenbach worked with the librettists Meilhac and Halévy more often than any other librettist or team and produced some of his most successful works with them. He said of his relationship with the team: Je suis sans doute le Père, chacun des deux autres est à la fois mon Fils et Plein d'Esprit (literally "No doubt I am the Father; each of the two others is at once my Son and Full of Verve"— esprit meaning both [Holy] Spirit and wit and Plein d'Esprit rhyming with Saint Esprit). Offenbach was much attached to his adopted country, and many of his works are very patriotic in nature. But when war broke out between France and Germany in 1870, ending the Second Empire, he was criticized by the French press as an immigrant agent of Bismarck and was forced to flee. Reviled by the German press as a traitor to his native Germany, he brought his family to safety in Spain and then toured in Italy and Austria. When he returned to Paris in June 1871 after the war, his operettas were out of favor with the public. Bonapartists thought that, by "turning royalty into a farce and the army into a joke", Offenbach's parodies had undermined Napoleon III's France and were therefore the cause, or at least one of the causes, of the defeat. Ironically, liberals blamed Offenbach for his perceived loyalty to the deposed emperor, and he had trouble with the police. During 1875 Offenbach was forced into bankruptcy. During 1876, though, a very successful tour of the United States at the occasion of the U.S. Centennial Exhibition enabled him to recover part of his losses. While there, he conducted two of his operettas, La vie parisienne and La jolie parfumeuse, and also gave as many as 40 concerts in New York and Philadelphia. Offenbach enjoyed renewed popularity with Madame Favart (1878), which featured a fantasy plot about the real-life French actress Marie Justine Favart, and La fille du tambour-major, a musically inventive piece. Most experts are of the opinion that his last work, The Tales of Hoffmann, was his only grand opera. It is more serious and more ambitious in its musical scope than his other works, perhaps reflecting the wish of the humourist to be taken seriously. The opera was still unfinished at his death in 1880, but was completed by his friend Ernest Guiraud and premiered in 1881. In 1938, Manuel Rosenthal (1904–2003) assembled the popular ballet Gaîté Parisienne from his own orchestral arrangements of melodies from Offenbach's operettas and the "barcarolle" from The Tales of Hoffman. Offenbach died in Paris in 1880 at the age of 61 and is buried in the Montmartre Cemetery, Paris. See List of operettas by Offenbach (99 works). Le papillon (1860) — ballet-fantastique in 2 acts (libretto: Jules-Henri Vernoy de Saint-Georges, choreography: Marie Taglioni). The only full length ballet composed by Offenbach; it was performed at the Paris Opera on November 26, 1860 and ran for 42 performances. Die Rheinnixen (Les fées du Rhin) (1864) — romantic opera in 4 acts (libretto: Nuitter, translated into German by Alfred von Walzogen). Performed at the Hofoper in Vienna on 4 February 1864. (Short pieces) Les roses du Bengale. Six valses sentimentales, Dernier souvenir, Valse de zimmer, Abendblatter, Schuler-Polka, Les boules de neige, Ländler, Le fleuve d’or, Valse, Le postillon, Galop, Jacqueline, Suite de valses, Polka du mendiant, Les contes de la reine de Navarre, Grande valse, Souvenirs de Londres, Polka, Herminien-Walzer, Madeleine, Polka-Mazurka, Les belles Américaines, Valse, Burlesque Polka, Valse composée au château du Val le 9 aout 1845, Musette, Les amazones, Les arabesques, Berthe, Brunes et blondes, Les fleurs d’hivers. 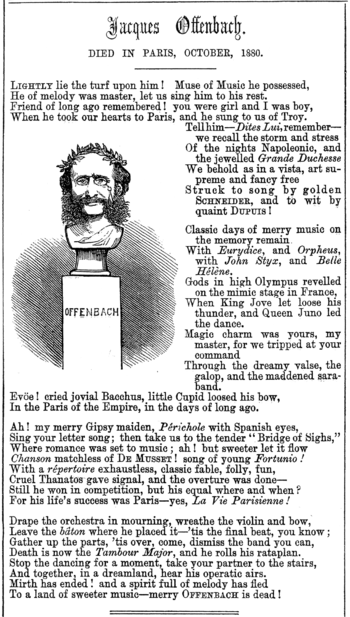 Elegy to Offenbach in the illustrated magazine Punch. Friedrich Nietzsche said about Offenbach: "If by artistic genius we understand the most consummate freedom within the law, divine ease and facility in overcoming the greatest difficulties, then Offenbach has even more right to the title 'genius' than Wagner has. Wagner is heavy and clumsy, nothing is more foreign to him than the moments of wanton perfection which this clown Offenbach achieves as many as five times, six times, in nearly every one of his buffooneries." Émile Zola commented on Offenbach and his work in a novel (Nana) and an essay (La féerie et l'opérette IV/V). While granting that Offenbach's main operettas are full of grace, charm and wit, Zola blames Offenbach for what others have made out of the genre, and what they are yet to make out of it. The operetta as a genre is, in Zola's eyes, a "public enemy", a "monstrous beast" that should have been "strangled" at birth; an echo of the Leipziger Allgemeine Zeitung, which had written in 1870 that Offenbach's operetta was precisely what Germany was fighting against. Zola makes two further points. One is that, as chapter I of Nana suggests, everything in and around the operetta performed in it (a take-off of Orpheus in the Underworld) is authentic. The theatre (bordel, as the director calls it), the actors, the audience and the operetta itself are authentically Second Empire. The second point concerns the nature of Offenbach's satire. Following Siegfried Kracauer's lead, most experts see Offenbach's works as sort of a social protest, an attack against the establishment. Zola asserts, however, that, even at its most scathing, the criticism offered in Offenbach's works was an homage to a "system" that not only tolerated satire at its own expense, but couldn't get enough of it. It is generally agreed that at some point in his career someone christened Offenbach "the Mozart of the Champs-Élysées," but this is where the agreement ends. While some of the sources attribute the saying to Richard Wagner, others assert that Gioachino Rossini said it. It is also a matter of dispute whether it was meant as praise or criticism. Jean-Bernard Piat's advice is not to use the expression at all. ^ Kaufmann, Jacobo (1998). Isaac Offenbach und sein Sohn Jacques, oder, "Es ist nicht alle Tage Purim". M. Niemeyer. pp. 226. ISBN 3484651210, 9783484651210. http://books.google.com/books?id=iIifAAAAMAAJ&q=ISAAC+OFFENBACH+UND+SEIN+SOHN+JACQUES&dq=ISAAC+OFFENBACH+UND+SEIN+SOHN+JACQUES&cd=1. Offenbach, Jacques. "The Story of a Waltz" in The Gaiety, Spring 2006, pp 28–33. Editor: Roderick Murray. Williams, Roger L. Gaslight and Shadow: The World of Napoleon III. NY: Macmillan, 1957, Ch. 4: "Jacques Offenbach and Parisian Gaiety"
This article is licensed under the GNU Free Documentation License. It uses material from the Wikipedia article "Jacques Offenbach. Allthough most Wikipedia articles provide accurate information accuracy can not be guaranteed.